The 1970 Pontiac Firebird line ushered out the coke-body style of the first gen Pontiac Firebirds and ushered in a new line of sleek, elongated elegance to the muscle car genre. The image of the Firebird above gives you a great view of some of the 1970 Firebird’s most important design changes. As noted by Old Ride, the bumper was molded from a rubbery plastic called Endura and then painted to match the rest of the car. This created a the illusion of the car being bumperless. The above image also provides a nice view of the single headlights and the split, layered side markers. Flush door handles were also a new feature for the 1970 models, but the handles are harder to see in this particular image. A total of 43,789 Firebirds rolled off the production line for 1970. These models didn’t begin selling until February of 1970, according to Edmunds, causing some to describe this year’s lineup as the 1970-1/2 Firebird. The Trans Am designation was the result of the addition of a Firebird specialty package. On all the Trans Am models, the package delivered upgraded handling, stronger suspension, and more horsepower, plus a few modifications that ramped up the appearance of the base Firebirds, like Ram Air hoods, rear spoilers, fog lights seated low in the Endura bumpers, and custom wheels. A few last things to note on the 1970 Firebird are its weight and dimensions. 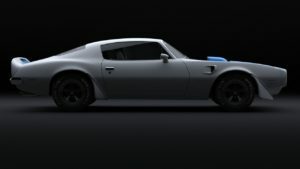 According to Auto Evolution, the ’70 Firebird weighed in at 3,239 pounds and measured 191.6 inches in total length with a wheelbase measurement of 108 inches. The Firebird’s total height was 50.4 inches and it measured 73.4 inches in width. 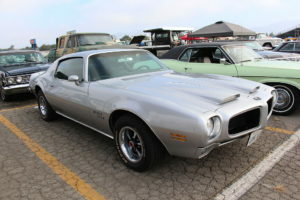 Part of the reason Classic Cars Online US exists is to help connect classic car buyers and sellers, and we’ve added several ways for you to connect, but first, be sure to visit the Classifieds page if you’re in the market to buy or sell classic cars such as the iconic 1970 Pontiac Firebird.